Summer in Australia wouldn't be complete without a trip to one of the country's famed beaches.Take your togs or cossies, your esky packed with amber fluid and maybe a dog's eye for a snack. Bend the elbow too much? Stop off for a long black, a short black or a flat white to make sure you don't end up a few kangaroos (roos) loose in the top paddock. Translation: Take your swimwear and cooler box full of beer and a meat pie to eat. A bit too much to drink? Have a small or large black espresso coffee or a white coffee to make sure you are fully compos mentis when you get home. Welcome to the Australian vocabulary. Beyond the stereotyped "G'day" (hello) of souvenir T-shirts and "Crocodile Dundee" movies, are many words rich in tradition that define the Australian identity and give continuity to the variety of voices and experiences that shaped the country's history. 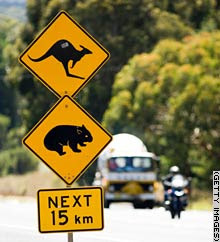 As a tourist they are fun to hear, but you'll need to learn them if you plan to call Down Under home. Under planned new citizenship tests designed by the government to bind a nation of immigrants to common values, would-be Australians will have to demonstrate they know the meaning of mateship, having a go and dinkum. Symbolizing the resourceful comradeship at the heart of Australians' self-image, mateship is a close bond of friendship, having a go means a willingness to try anything, while dinkum means genuine or true. Assuming you pass the tests and move to Australia, you'll probably find yourself flat out like a lizard drinking, that's extremely busy, from the hard yakka or labor of your new job. If you get time for a beach picnic try not to let the heat and beer make you chunder or vomit in the dunny, that's toilet. If one word can perhaps symbolize the development of the Australian vocabulary, it could be chunder. Legend has it that the word hails from the time of the British ships that transported convicts to the new colony of Australia. It was a 12-month trip on stormy seas -- a prescription for sea sickness. The convicts were housed in bunk-like beds, where they generally ended up when feeling ill. Anyone on the top bunk who was about to vomit would yell "watch out under" to warn inhabitants of the lower bunks of the impending delivery. As with most Australian slang, the original phrase got shortened over time, and watch out under became chunder -- or so the story goes. Setting up home in Australia will require a stop at a manchester shop. Manchester is what the locals call bed linen, because Manchester, the northern British industrial city and one-time center of the cotton-spinning industry, was the main source of bedding for Australia's early settlers. They'll also sell you a doona -- a bed quilt usually filled with feathers and called a duvet in other countries. If you want it delivered, you'll get a docket (receipt) to show the driver. If you're hungry after shopping, pick up a lamington -- a square cake made of sponge rolled in chocolate and sprinkled with coconut, supposedly named after Charles Baillie, 2nd Baron Lamington and governor of Queensland state from 1896 to 1901. The cake may have originally been made either in an image of the baron's favored hats, or as a way of using up left-over stale sponge. Either way, it's said the baron hated them. Or try an Anzac biscuit, named after the Australian and New Zealand Army Corps (ANZACS) who fought in the First World War and whose grit, courage and consummate mateship are imprinted on the national consciousness. A hard biscuit typically of oatmeal and coconut with syrup or treacle, some say it was made by women at home to send to soldiers on the killing fields of France and Gallipoli in Turkey. Others say the name did not appear until after the war.Sweets or candies are called lollies in Australia, and they don't have to be iced, as the word would mean in Britain. Of course it's not all sweetness in any country. In Australia you'll want to avoid a stoush, that's a fight but with the 'ou' pronounced as in 'ouch', with a larrikin or troublemaker, where you might suffer a Larry Dooley or a beating, derived in part from the name of a boxer famous a century ago. And watch out for rorts, that's frauds or con tricks. Unless of course it's only a furphy -- a rumor. This word is derived from World War One battlefields where rumors traveled with the carts bringing water to the soldiers in the trenches. The carts were made by the Australian company Furphy.